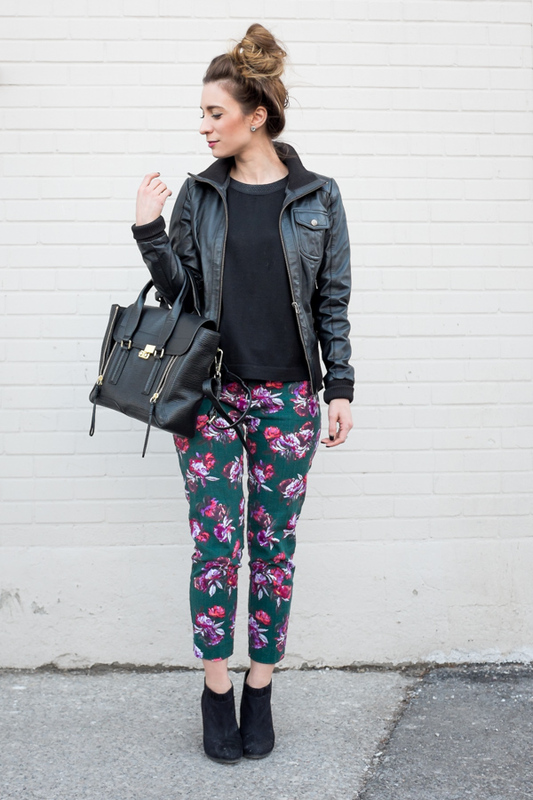 OOTD - Floral Ankle Pants | La Petite Noob | A Toronto-Based Fashion and Lifestyle Blog. It might be a little too early to celebrate, but the weather has slowly creeping into the positives and feeling a little bit like Spring. As much as I'm celebrating the arrival of a new season - especially since that new season isn't Winter - it brings on the new challenge of transitioning one wardrobe to the next. These Anthropologie floral Charlie trousers are a great piece to start adding into your Winter clothing rotation to ease into Spring. The floral pattern is beautiful, and the colours are rich enough to pair with a darker Winter palette. I especially tend to rely on a leather jacket during the Winter-to-Spring transition for it's warmth and versatility. Read on for all outfit details and additional photos. These floral Charlie pants from Anthropologie were a great find that I picked up at the end of Fall; they were in their sale section and were further discounted with a coupon code. These are my first pair of Anthropologie pants, and they won't be my last - the store is a great resource for bold patterns and statement pieces. I especially appreciate the fact that Anthropologie has a generous petites section, as this shorty has the hardest time finding pants and blazers that fit properly. My only caution is to size down - I got these floral pants in my normal size and between the generous fit and a bit of stretching, I really could have gone a full size down. What are your favourite ways to transition from one season to the next? Love this! Those colours in those pants make them the perfect transitional piece. I need to start frequenting the sale section of Anthropologie. I never seem to find anything that works! I'm totally with your Gabriella, I never seem to have much luck when I browse the Anthropologie store (although I love being in there - so pretty!) I have way more success online! Gorgeous trousers, love the print. I definitely need to add something like this to my wardrobe! Thanks Claire, I'm glad that you like them! I've become obsessed with anything floral, and these pants are no different! I'm with you Alecia, floral all the way!! Ohh I can't wait to start incorporating pastels into my wardrobe! It's still slushy and dirty around the city here, but soon enough! Love love love this look! And totally agree with you - that leather jacket is the perfect transitional piece. So gorgeous. Let's keep those fingers crossed!